I am sure at some point in time, we would have expected blazing speed when we upgraded over from dial-up to cable broadband, and finally to fiber optics these days. But despite all the advertisement of the upload and download speeds, you will find some disclaimers somewhere that actual performance depends on the site of origin as well as your own equipment perhaps? I don't have much entertainment, except for taking care of the kiddos, surfing the web on my mobile and playing some online games when I am back home. So does my wife, who loves catching up on her Korean drama after work. And we all know how important it is, for us to do all that on home WiFi instead of relying on our mobile plans because that would burn out the month's quota in no time! For the unsuspecting people who come over our place, we may seem like parents relishing the moment when the kiddos play around in the living room, while keeping an eye on them, with the occasional checking of our phones perhaps. But the truth is we were all stuck in the living room because our freaking home WiFi range doesn't extend to our air-conditioned master bedroom! We had tried leaving the room door ajar and shifting our positions within the room to catch the best signals but often with very little success. So much so that sometimes due to my laziness, I even had to resort to switching to my mobile data plan so that I don't run the risk of getting disconnected half-way through my online game battle! That was until we were presented with AC1200 Wi-Fi Range Extender by D-Link! The first thing I looked for was the instruction menu, which I couldn't find (Edit: found the instruction menu and warranty card at the bottom of the box). But that was no biggie because there were only a few simple steps to set it up and it was all printed on the exterior of the box itself. Plug the Wi-Fi into a power socket between your router and where you needed boosting. Choose a midpoint for best results. Press the WPS button on your route once. I couldn't find mine and had to google though. Pardon the dust on my WiFi Router! But you can see the WPS button at the back right? 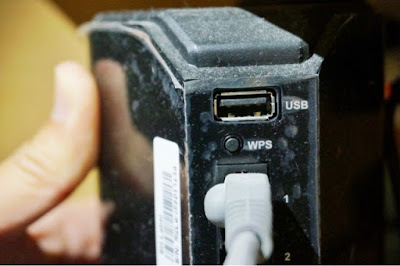 Press the WPS button on the Wi-Fi Extender and just wait for it to get connected! 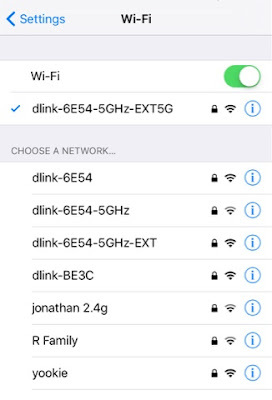 You will be able to detect the extender from your devices. It will have the same name as your device followed with the "EXT" behind. I cannot believe that the constant nagging of my wife on the bad connectivity when watching her Korean dramas is THAT easily resolved with just this little box. I can even play my games while multitasking in my master bedroom toilet now. I should've gotten this much earlier! And if you are suffering from the same problems as I did earlier, don't hesitate to try out this nifty little thing! 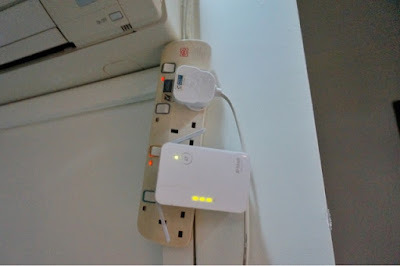 Now that my connectivity issue is solved, I couldn't be bothered with how unsightly my extension cord looked! 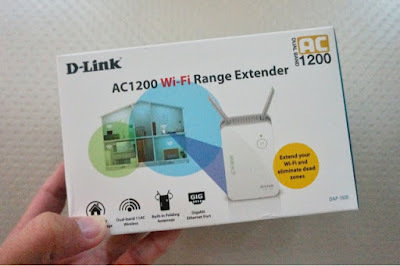 Thank you so much for the review set DLink Singapore, it was sure a life-saver (both ingame and real life)!